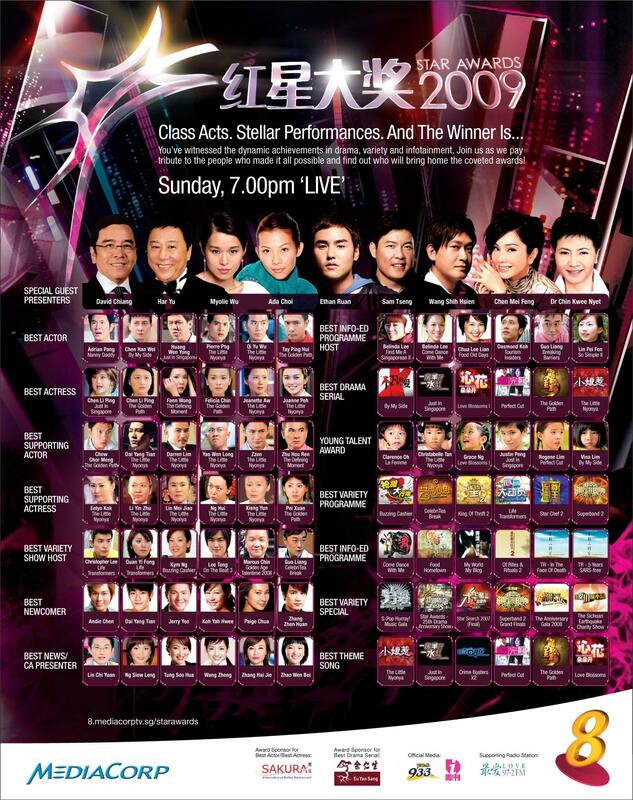 Will you be watching Star Awards 2009 tomorrow 7pm, Channel 8? 16 April 2009 – ‘The Little Nyonya’ sweeps a total of 24 nominations in this year’s Star Awards! Nominations include Best Director, Best Screenplay, Best Production Design and Best Editing in the Professional categories, making this an additional 8 nominations to its current 16 nominations announced earlier in the Programme and Performance Categories. The results of the Professional Categories were announced at the Star Awards Gala Dinner & Award Presentation next Tuesday, 21 April at Mandarin Oriental Hotel at 7pm. See if you can view it. Talking abt journey planner, my previous post did not include SMRT buses, only SBS Transit. To know the bus route details, operating hours and frequency range of both SBS Transit and SMRT Buses, click this link. In there, you can also calculate the fares, the estimated travel time and the no. of stops of your bus journey by selecting the start and end point. But this is useful only if you know which roughly which bus you want to take. What if you just know where you want to go? U want to know how to go from point A to point B without much hazzle..
Long time ago, I already utilize this search engine for direction – street directory. It used to be good. But now, you can roughly find a place (near which MRT) using streetdirectory. Sometimes, it is not very useful if you want to know how to get to there! I am more of a MRT person.. I do not drive, so I don’t really know road names well. But tell me it is near which which MRT, I will know roughly where it is in Singapore. And this is also the reason I prefer to stay near the MRT. Walking distance is good. 3-10mins is good. Since I am not a bus person, I seldom or never really visit the SBS website. Oh btw, us commuters may be pleased wit this news! “there is a reduction in bus and train fares with effect from 1st April 2009 to 30th June 2010.” Yes!! 3 multiple answers are given, nope.. no answer is given on the spot. So I memorize their website, making a note to myself to remember to check whether the answer I guess is right or wrong..
And Yes, it is correct! 以下的哪一句成语是英文谚语 “to put all eggs into one basket” 最适当的翻译? The Promote Mandarin Council has launched an exciting new initiative, The Chinese Challenge, to encourage Singaporeans and Permanent Residents to enjoy and improve their Mandarin and deepen their knowledge of Chinese culture through experiencing the finest in Chinese culture and language. Have u file ur tax? More than 536,000 taxpayers have e-Filed. Avoid the last minute rush and e-File now! I always felt that I pay high income tax!! It is just coz being single is expensive. Plus my parents are not with me in Sg. So I lost out in term of rebates or reliefs or tax-deductions…. It is no surprise that I paid more tax $ than others who have much higher salary!! Luckily this year government is giving us 20% discount on our tax $..
And still Singapore’s income tax is considered low among other countries… so I am counting my blessings.. So have u file ur tax yet? Click here to know how to calculate ur tax!